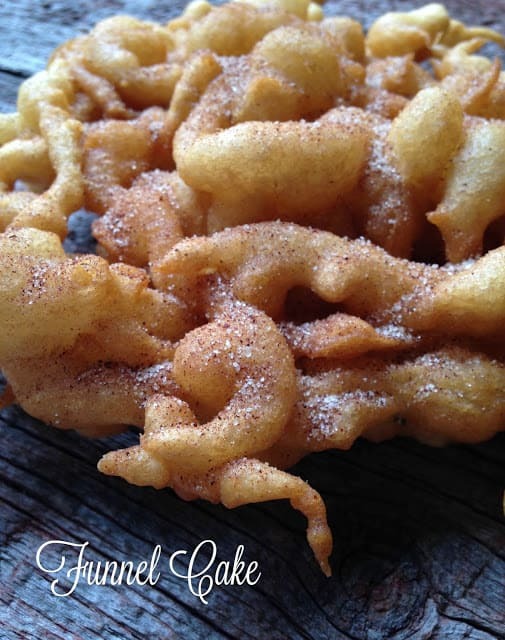 That Classic Carnival Treat…Funnel Cakes! The Funnel Cake is considered by many as “The Queen Of the Fair” A crispy, crunchy, carnival sweet treat, enjoyed by kids and adults alike. 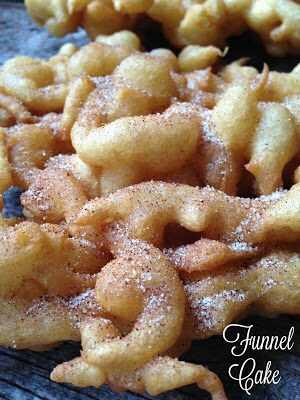 Every summer at county fairs, carnivals and at the ballpark, the sweet aroma of funnel cakes fill the air. Other popular and favorite foods found at ballparks, fairs, carnivals and festivals are: cotton candy, corn dogs, sno-cones, fried pickles, french fries, caramel apples and kettle corn. At first funnel cakes or fritters were made by pouring a yeast or sourdough batter into a bowl with a tiny hole in the bottom. The cakes were fried, then sprinkled with salt and served with syrup. I would definitely like to try this method…using my sourdough starter to make the batter and an old plastic bowl. Certainly sounds easy enough and I’m positive that the sourdough batter would be wonderful, giving the funnel cakes a delicious tang. The Pennsylvania Dutch, served funnel cakes at the Kutztown Folk Festival and they became very popular. The cakes were deep fried and sold for $.25 each. 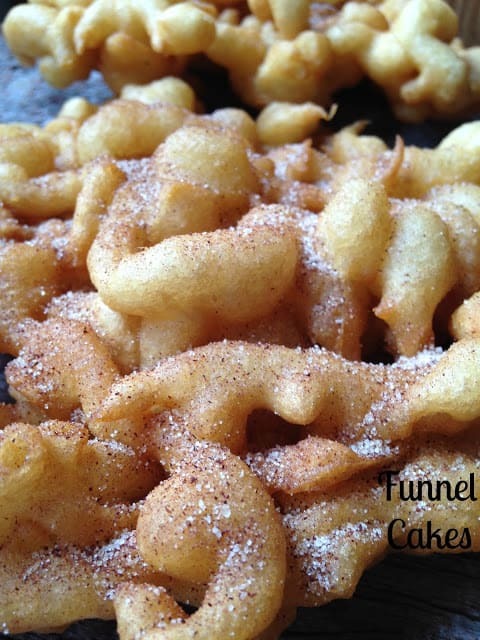 After selling thousands of funnel cakes during the festival, the funnel cakes became the trademark dessert at every Pennsylvania Dutch festival from that point on. Funnel cakes are a global treat and many cultures have their own version of this deep fried, batter dessert. Here are a few examples: Beaver Tails- Canada, Beignet- France, Berliner- Germany, Churros- Mexico, Khvorost- Russia, Oliebollen- Netherlands, Rosette- Sweden. Funnel cakes can be topped with many different things such as: fruit, whipped cream, chocolate syrup and/or Nutella. 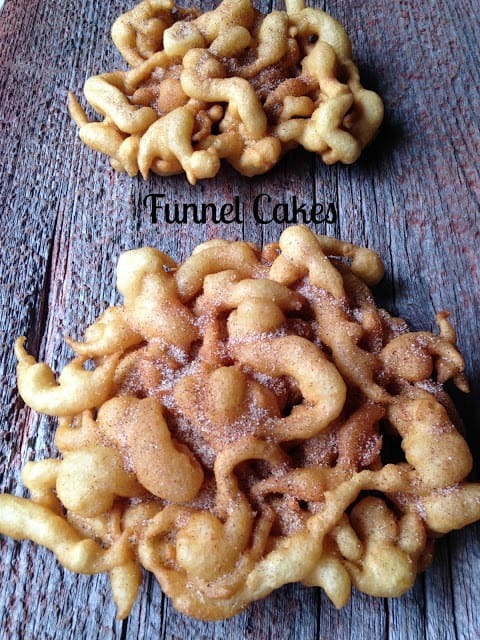 I made my funnel cakes using a pre-made Funnel Cake Mix and Pitcher set that I purchased at the grocery store. 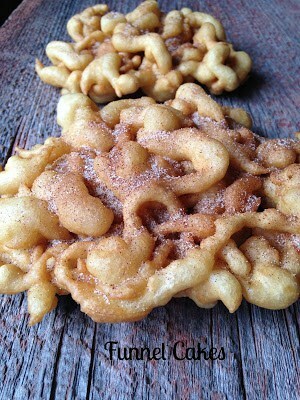 You can usually find these Funnel Cake Sets at most grocery stores or super stores during the summer months. Some specialty stores now carry them year ’round. Step 1: Combine funnel cake mix pouch and 1 1/3 cups of water in bowl. Whisk until smooth. Batter should be comparable to that of waffle or pancake batter. Pour funnel cake batter into pitcher. Step 2: Pour oil into deep (3″ deep) cast iron 8″ skillet. Oil will expand when heated, do not overfill pan. Heat oil to 350º to 375º. Step 3: Hold the pitcher 2 inches above oil and pour batter in a circular motion creating a lattice design. Fry for 30 seconds or until edges are golden brown. Carefully pick up cake with metal tongs, turn over and fry for 20 seconds longer. Step 4: Remove from oil, drain on paper towels. Step 5: Sprinkle with powdered sugar, cinnamon-sugar or your favorite topping while still warm. Hungry for more? Try these. Homemade Corn Dogs and Beer Battered Deep Fried Mushrooms.